Learning how to properly eat Korean BBQ can be confusing. Do you flip the meat on the grill yourself or wait for a server to do it? Is it OK to ask for more banchan (side dishes) if you finish them? 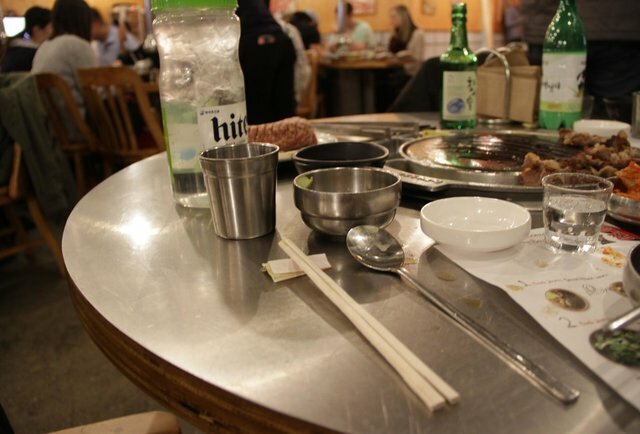 And should you pair your meal with multiple soju bombs or a lot of soju bombs? Trick question, it's both! In the interest of doing Korean BBQ right, we spoke to Deuki Hong, the co-author of Koreatown: A Cookbook who did a two-year stint at popular NYC Korean BBQ restaurant Kang Ho Dong Baekjeong, and is now working on opening Sunday Bird, a fried chicken spot in San Francisco. He knows how to get the most out of the meat-filled meal, and reveals the one thing you shouldn't leave at home before you go out for KBBQ. He's going to share with you how to do it right, and how to not look like an idiot while eating Korean BBQ. "Korean barbecue is expensive," Hong says. "Meat prices are on the rise." Because KBBQ is a large-format meal that's all about eating as many different foods as possible, it helps to bring more people. Because the more friends you invite, the more food you get to order and try! It's kind of like a pyramid scheme, but you get a ton of grilled meat instead of money. And it also won't screw you over like a pyramid scheme! Hong recommends going with a group of at least four to six people and bringing cash! It's easier than splitting six credit cards. Hong is quick to point out that there aren't any hard-and-fast rules about whether to use metal or wooden chopsticks when you eat KBBQ. But he does say that wooden chopsticks are typically used for hot or cold noodles, since they grip 'em better. So if you only see metal chopsticks on the table, ask for wooden ones. If the restaurant doesn't have them (which is unlikely! ), feel free to tell the server to get a grip, and then wink profusely. There are a few obvious places to set your chopsticks when you're done using them -- on the side of your rice bowl or directly on the table. But if you want to look like you know what you're doing, Hong says you'll see a lot of Koreans fashion a makeshift chopstick stand from the paper wrapping they come in by folding it up. Or you can just be lazy and put them on the rice bowl. The choice is yours! "Banchan are side dishes that differ from restaurant to restaurant," Hong says. The servers will bring them out before the main course, but that doesn't mean they're an appetizer. They're meant to be sampled throughout the meal, as the dishes typically have acid and vinegar. You'll appreciate that when the acid cuts through all the rich meats soon to be on your plate. And while you may not be able to identify some of the dishes (it's mostly different varieties of kimchee, pickles, eggplant, and other assorted veggies), just shovel that stuff into your mouth and trust that everything will be OK. Because it will! "Be adventurous!" Hong implores. "Try everything once! Nothing there is gonna hurt you." He sounds like a man who's never been hurt before. Hong's favorite banchan is the fermented kimchee, which he says pairs beautifully with hot meat off the grill. And if you finish that tiny portion, ask for more. They'll bring you out as much as you can handle, and it's free. There might not be free lunch in America, but there sure is free dinner. The meat selection at a KBBQ spot can be overwhelming, a feeling you might recognize if you've tried to buy toothpaste lately. How do that many toothpaste varieties exist in the world? Do you want pork jowl? Brisket? Beef tongue? Pork collar? While they're all delicious, Hong recommends starting with a couple of KBBQ essentials. "You must try the marinated short rib," he says. "I love the short rib combined with the sweetness of the soy. And I'm also a big fan of non-marinated pork belly." Oh, and be sure to order rice to pair with the meat. "I can't eat meat without rice," Hong says. Don't worry if you're confused on how much meat to order. Hong says that it can be tricky even for Koreans. That's because unlike at a steakhouse, where you might order an 8oz steak for yourself, here you're ordering for the group. And the amount of meat in each order is not usually listed on the menu. "This isn't a hard rule, but I think one order of meat usually feeds two people," Hong says. Sometimes one order can feed four people though, so the safest thing to do is order less. You can always order more meat later if you're hungry. You probably won't be hungry (unless you're The Mountain from Game of Thrones), but this style of dining is all about ordering as you go anyways. OK, so you've managed to order properly, and the servers have brought out that glorious tray of raw meat and thrown it on the grill. Then they leave. If you're an anxious man like me, you might wonder when the hell someone's going to come back and flip the meat. Hong says the servers might cook it for you, or might not. But they'll usually ask! Your answer should be that you want them to cook the meat. But if you're somewhere where you have to cook it all by yourself, don't fret. While you're watching the meat cook, there's one thing to look for to know if it's ready to flip. Hong says to look for "a little sweat on top" of those hunks of pork and beef. No, not the sweat dripping from your forehead because you don't know when to flip the meat. "Wait for the water to pool up on top, since that means it's ready to flip," he explains, as if you wait too long, the meat can become dry. "It's like when you see bubbles popping up on pancakes." Hold on to that info, as it's something you can use should you ever open your own KBBQ spot. It could happen! You know that kimchee you've been ignoring on the table since the meat came out? Throw some of it on the grill! Hong says if you have some pork belly fat sitting on the grill, get the kimchee all mixed up in there and then get ready to blast your taste buds to Flavortowne. Nope, not Guy Fieri's Flavortown. This place is spelled completely differently... please don't sue us, Guy. 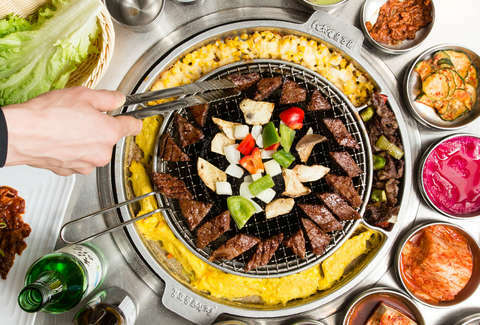 Servers at a Korean BBQ spot should swap out the grill for you, depending on whether you're cooking beef or pork. If the restaurant doesn't swap the specialty grills for the meats you're cooking, ask for a new one! Pork should be cooked on a plate grill. Beef needs a mesh grill. Some KBBQ spots will have charcoal under the mesh, and some will just have a burner. If you're lucky enough to get charcoal, all the delicious drippings (like fat and marinades) from the meat will hit the charcoal, which will envelop the beef with a flavor-filled smoke. Hong says there are three basic booze options when it comes to drinking with your KBBQ: soju (a basic rice wine), takju (a cloudy rice wine), and Korean light beer. He's not a huge fan of any of these on their own (to him, the light beer "tastes like bad water"), but he says that he loves a soju bomb, which is when you drop a shot of soju into a glass filled with 70% beer. "It's one of those situations where a negative times a negative equals a positive," he says. If we were better at math, we'd be able to fact-check that, but it sounds about right. You're probably going to have some barbecued meat leftover after you are done stuffing your face. Hong recommends ordering cold beef broth noodles and mixing them with any leftover marinated short rib that's still hot. "The hot-and-cold play is ridiculous," he says. "That's a real insider tip." Hear that? You're an insider now. You know all the Korean BBQ secrets. Now go forth and barbecue. Lee Breslouer is a senior writer for Thrillist, and enjoys brisket. Follow him to kimchee @LeeBreslouer.